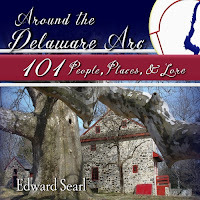 AROUND THE DELAWARE ARC is an information-packed collection of 101 short narratives about the people, places, and lore that converge in a unique Landscape of Meaning, creating a mutual enchantment of place and person. These elegantly written narratives stand alone, each telling its own story. However, when the narratives are read together as related groups, or better, as a complete collection, the Landscape of Meaning becomes palpable. This book is a good read on its own merits, and should the reader wish to explore the area, will help the explorer better understand and more deeply experience Northern Delaware and Southeastern Pennsylvania – AROUND THE DELAWARE ARC.